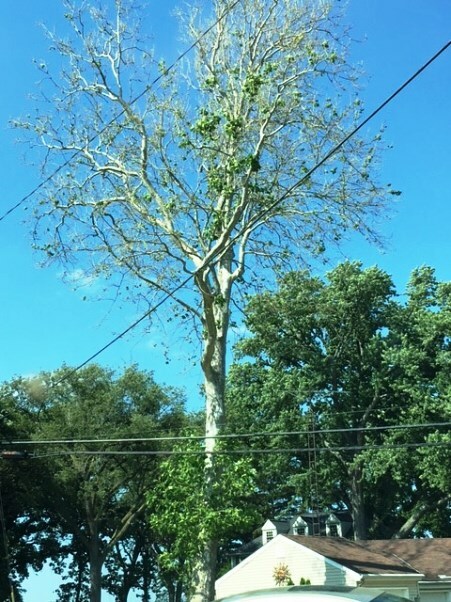 This morning I got a message from Frank Leon, horticulturist with Barnes Nursery, complete with the above image showing the thinning of sycamore (American planetree; Platanus occidentalis), a common sight seen in northwest Ohio this Spring. The problem is sycamore anthracnose, caused by the fungus Apiognomonia veneta. This particular anthracnose fungus occurs on planetrees, including our native sycamore, but less so on Platanus orientalis and the hybrid between these two planetrees, Londone planetree (PlatanusX acerifolia), first described from Vauxhall Gardens in London centuries ago. This anthracnose fungus does not infect other trees, such as ash, oak, dogwood, maple, etc. These trees are affected by other anthracnose fungi. Sycamore anthracnose near the Ohio River in Marietta in past years. Trees recovered well. Sycamore anthracnose is rarely deadly, but can make the trees unsightly and cause areas of the tree to die back. Leaf symptoms are typically along veins.The fungus overwinters on twigs and then splashes onto new growth, attacking the new buds and twigs in the spring. The disease is most prevalent and damage is greatest following cool wet spring conditions, especially with leaf development and expansion on planetrees when temperatures are at 50 degrees and below. Fortunately, planetrees put out new leaves and damage is often not very noticeable by early- to mid- July. Sprays are usually not warranted for most planetrees since damage to overall health is typically not severe. Sprays are especially not recommended at this point because conditions for infection are no longer present, the thicker, more mature trees are less susceptible, and earlier infections cannot be eradicated anyway. Watch the planetrees recover.